Your home is the single largest investment of your life and the best part is that this can also help you save taxes. Real estate is actually one of the most popular tax-efficient investment options facilitated by the Government, particularly the first home especially if a home loan is availed. “The latest change in GST rate which is 1% on affordable units (60 sq mt for metro and 90 sq. mt for non-metro cities as carpet area) and 5% on rest of the category and notional rent on second property has been abolished that was taxable earlier also helps,” says Dinesh Jain, MD- Exotica Housing. PMAY (Pradhan Mantri Awas Yojna) offers interest subsidy under CLSS (Credit Linked Subsidy Scheme) and on a unit of ₹35 lakh, a home buyer can save ₹2.76 lakh maximum in the form of subsidy via direct bank transfer. “Currently, a buyer pays anywhere between 5-7% of the property cost as stamp duty and registration taxes depending on the respective state. “For instance, suppose ‘x’ bought a house in the year 2018 for INR 50 lakh and paid INR 5 lakh as stamp duty and registration charges. He will be entitled for tax benefits computed during the fiscal year 2019-2020, only if all the expenses have been paid during 2018-19,” says Anuj Puri, Chairman – ANAROCK Property Consultants. There are no tax benefits if the home loan payments are made during the pre-construction phase Section 24 – allows a tax deduction of any interest portion payable in home loans. “Unlike the deduction under 80C, Section 24 runs on an accrual basis. If interest on home loan accrued in a year which has not been paid in that year, the interest can still be claimed for that financial year,” says Abhinav Angirish, Founder, Investonline.in.. CA Maneet Pal Singh, Managing Partner, I.P. 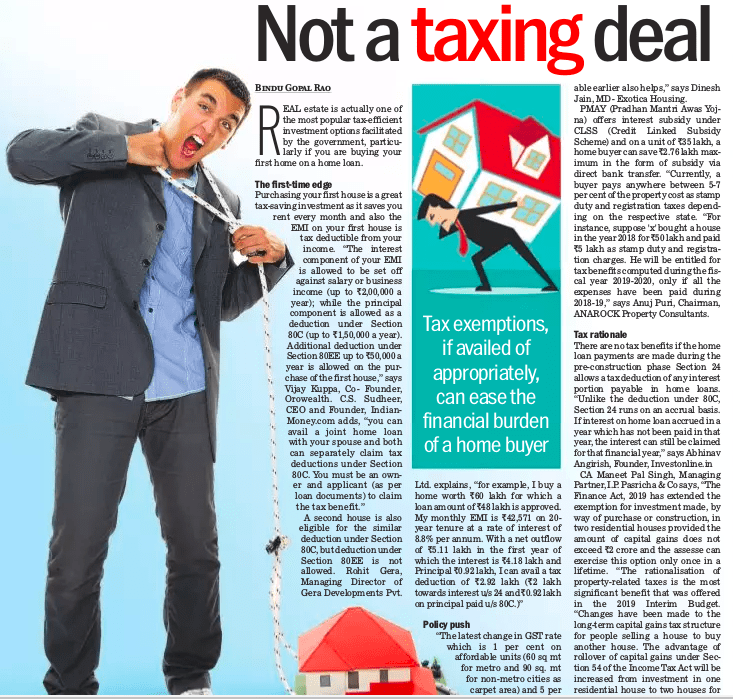 Pasricha & Co says, “The Finance Act, 2019 has extended the exemption for investment made, by way of purchase or construction, in two residential houses provided the amount of capital gains does not exceed ₹2 crores and the assesse can exercise this option only once in a lifetime.” The rationalization of property-related taxes is the most significant benefit that was offered in the 2019 Interim Budget. “Changes have been made to the long-term capital gains tax structure for people selling a house to buy another house. The advantage of rollover of capital gains under section 54 of the Income Tax Act will be increased from investment in one residential house to two houses for tax payers having capital gains of up to Rs 2 crore,” adds Rakesh Reddy, Director, Aparna Constructions & Estates Pvt. Ltd. So are you ready for a home that helps you save tax too?